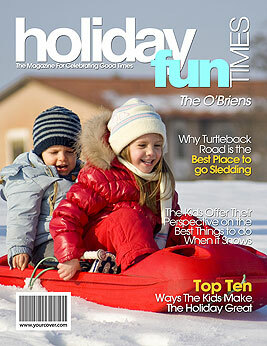 The Holiday Fun personalized magazine cover celebrates the happy memories of your celebration. Includes your photo and custom headlines. Fun idea: use this template for personalized holiday cards! Looking for a unique holiday gift for a special friend or family member? Make them feel like a star by putting them on their very own fake magazine cover! The "Holiday Fun" personalized magazine cover is a unique gift for the holidays especially for someone who has everything or is hard to buy for. Simply upload your photo to the YourCover magazine cover generator then revise the default headlines to be all about the person starring on the front cover. Whether the personalized gift you need is for a man or a woman, part of the fun of creating a fake magazine cover is making sure your friend is the center of attention. There’s no better way to do that than with a fake magazine cover gift from YourCover! Completely customizable from the font to the taglines, your personalized gift will be the hit of the holidays. Using our magazine cover generator to make a magazine cover you will be able to include special memories you’ve shared with the cover star while also poking some good-natured fun at them. The magazine cover generator has an easy-to-use photo upload feature for adding your photo to the fake magazine cover template. In addition, it also provides default headlines for you to customize as well as a library of suggestions so that your fake magazine cover reflects your friend’s likes, dislikes and true life story. The unique back cover feature is available just in case you have more photos and info than can fit on the front. When you are done you will have created a personalized holiday gift that will be enjoyed for years to come. In a hurry and need a last minute gift? Just upload your photo, personalize the headlines and you are done. Simply purchase the downloadable photo file for an instant gift that you can print at home. Or let us print your personalized magazine cover for you; we also offer frames, posters, mugs and other accessories as well as a gift service, rush shipping and international shipping. The best personalized gift idea is a fake magazine cover from YourCover – a gift as unique as the recipient!